Their campaign will continue, however. The group will now focus on political campaigning. 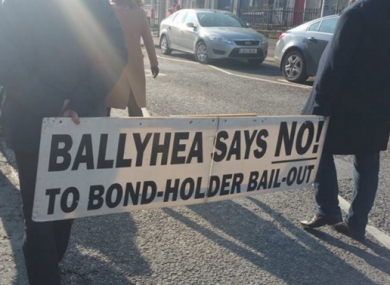 FOR THE FINAL time today, Ballyhea will march against the imposition of banking debt on the Irish State. The Ballyhea Says No campaign has marched every Sunday since this day five years ago, 6 March 2011. Now, it is suspending its weekly march to instead concentrate on building the campaign politically and in the media. During the past five years, the group has reached a number of important milestones, including several meetings with the governor of the Central Bank and a march to the ECB headquarters in Frankfurt. Diarmuid O’Flynn, the man who organised the first march, also ran in the 2014 European elections and the recent general election. Although not succeeding in either vote, his performance showed the appetite for their campaign. Final weekly #BallyheaSaysNo march this morning. We had two primary aims: first shine a light on the wrong that has been done and is still being done to Ireland vis-à-vis the bank-debt imposition and second, right that wrong. O’Flynn says the Ballyhea Says No group will now concentrate on supporting specific campaigns, such as Joan Collins TD’s constitutional challenge to the legality of the promissory notes. Other initiatives include supporting the drive to establish a cross-party committee that will “bring this bank-debt justice fight to Europe”. “It was never our belief that our group could do this on our own, never our intention to march every week for five years, 262 weeks,” says O’Flynn. We believe now though that it is time for us to step back into the shadows and to hand this over to those more able and more qualified to take on this cause, not just on our behalf but on behalf of the people of this noble nation. Email “After five long years, Ballyhea will march to say “No” for final time today”. Feedback on “After five long years, Ballyhea will march to say “No” for final time today”.